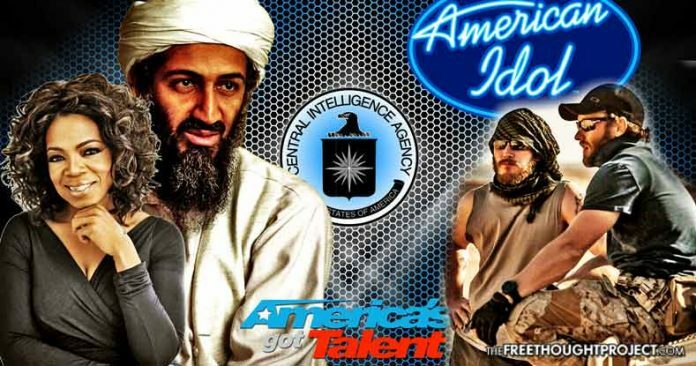 Newly-obtained documents show the Pentagon and CIA have enormous influence over Hollywood — its pro-war propaganda must be accepted or the government packs its assistance and goes home. Hollywood magic doesn’t percolate only in the minds of legendary producers and acclaimed directors to be brought to life on the big and television screens where actors’ adept performances capture our imaginations; rather, if the plot pertains to the military, it’s more than likely the Department of Defense had a hand in the script. From Meet the Parents and America’s Got Talent, to Cupcake Wars and Zero Dark Thirty — even Iron Man, Oprah, Patriot Games, and the James Bond thriller, Tomorrow Never Dies — if the production pertains to the War Machine or Surveillance State, it’s a veritable guarantee government significantly influenced the final product. Censorship apparently reigns more supremely over Hollywood than we’d ever surmised — nearly 1,800 movies and TV shows have borne the fierce scrutiny of the eagle-eyed Pentagon and CIA. In fact, according to documents obtained by Tom Secker and Matthew Alford for Insurge Intelligence, the DoD and CIA, and more frequently the NSA, don’t take kindly to portrayal in a negative light — even when that well-deserved derision and criticism covers past exploits long common public knowledge. It may be better known how the Pentagon consults with Hollywood to ensure accurate portrayal of chains of command, military culture, proper use of equipment, and other obvious factors, but the DoD, it turns out, might as well pen the script — and, in many cases, that’s exactly what happens. When applicable, films and television series must be rubber-stamped by the government — no seal of approval, no production. Most often, DoD chief Hollywood liaison, Phil Strub, grants the ‘seal’ for productions where Pentagon guidance has been officially sought — anything amiss would require rewrites and adjustments to accommodate the military’s best interests. Instances where the two cannot come to agreement can mean scrapping the entire production — and it has happened before. “If there are characters, action or dialogue that the DOD don’t approve of then the film-maker has to make changes to accommodate the military’s demands. If they refuse then the Pentagon packs up its toys and goes home. To obtain full cooperation the producers have to sign contracts — Production Assistance Agreements — which lock them into using a military-approved version of the script. Lest there be any doubt, the DoD’s weighty presence in filmmaking extends to the most picayune of details. Insurge Intelligence describes several instances in which one-liners and dramatic repartee the average moviegoer wouldn’t necessarily think twice about featured as the subject of bitter, behind-the-scenes quarrels pitting itinerant directors against the PR interests of the U.S. military — with the latter, one way or another, forever the victor. Tomorrow Never Dies provides a sound example, telling of the Pentagon’s fastidiousness as it lords over the silver screen, but more so in the State’s desire to remain a surreptitious influence. “This line was removed at the request of the DOD. “Strangely, Phil Strub denied that there was any support for Tomorrow Never Dies, while the pre-eminent scholar in the field Lawrence Suid only lists the DOD connection under ‘Unacknowledged Cooperation’. So meticulous the world’s most gargantuan military, even the ostensively fictitious name of an operation to capture the Hulk in the eponymous 2003 movie had to be switched to “Angry Man” from “Ranch Hand” — because the latter “is the name of a real military operation that saw the US Air Force dump millions of gallons of pesticides and other poisons onto the Vietnamese countryside, rendering millions of acres of farmland poisoned and infertile. Rather than risk summoning the specter of government indiscretion and corruption, production of Countermeasures ceased. “Brandon did this most prominently on the spy thriller The Recruit, where a new agent is put through CIA training at The Farm — an obvious vehicle for inducting the audience into that world and giving them a glimpse behind the curtain. The original story treatment and early drafts of the script were written by Brandon, though he is only credited on the film as a technical advisor, covering up his influence on the content. Why all of this matters comes down to censorship and propaganda — these are top government entities privileged with unhindered access to Hollywood — the result amounting to pro-war American exceptionalism, bereft of wrongdoing anywhere on the planet, where past wrongs vanish and a U.S. agenda can do no wrong. And that’s at least problematic. Hollywood beckons those weary of ordinary life — wage slavery, debt, eviscerated freedoms — all of it, gone, for a pricey ticket. Perhaps the penultimate captive audience, moviegoers likely don’t realize — much less, care — about the involvement of the Pentagon or CIA if it contributed to realism in film. Depicting conflict, war, and clandestine exploits in an heroic manner not only betrays the raw messiness of reality, but erases the fuzzy lines over which the military frequently leaps — the delineation obviating human rights abuse, war crimes, corruption, mendacity, and other indiscretion made couth through the magic of the silver screen. Sometimes, that deflection is accomplished through the vilification of single bad apples — Pentagon and CIA consultants proffer a single patsy for scorn in film — rather than risking their entire existence over bad PR, even when earned and well-known. “This idea of using cinema to pin the blame for problems on isolated rogue agents or bad apples, thus avoiding any notion of systemic, institutional or criminal responsibility, is right out of the CIA/DOD’s playbook,” Secker and Alford note. Notably, it isn’t as if the military and CIA act in an official capacity as ‘censors’ — producers would be free to nullify their cooperative arrangements and receive no assistance — but that so many eagerly adopt government strictures and edits to see production completed indicates a power unfettered in Hollywood. Glorification of war must be achieved with constant bombardment in advertising and the news to keep recruitment viable and service an appealing option — lest the Pentagon be unable to cull order-followers from freer thinkers among us. Because, in fact, war isn’t glorious. It isn’t glamorous. It isn’t a series of epic battles between wholly honorable soldiers fighting coal-hearted villains at the behest of dictators whose only goal involves the crushing of spines. War is ugly — impossibly complex, gruesome, duplicitous, savage at times — even from the sterility of a drone control room, the bombs fall on human beings, an interminable list of innocents killed by soldiers from every side fighting their various politicians’ wars can attest to its abhorrence. And if you know that, you’re less likely to enlist, less likely to approve military escalation — less likely to protest a war in this patriotic wrapping and festooned with a ribbon of tradition. War and spy games come to life on the big and little screens portray adventure, intrigue, drama, and suspense — but they are not real life — no matter how authentic the Pentagon affirms their details.